Hi and happy Monday, I’ve been excited to write about my trip to Kenya, Tanzania, and Zanzibar since I came back and I mapped it all out a few days ago and I think I actually have some really exciting and memorable stories to write about from this trip. I hope they are as fun to read as they will be to write for me. To start though, my friends and I booked an REI adventures trip to climb Kilimanjaro and the total length of that portion of the trip was 9 days, Sunday to a Monday. We arrived in Nairobi on Saturday (left Friday) after enduring about 24 hours of travel, and stayed at an airport hotel in Nairobi overnight with an early flight Sunday morning to JRO (Kilimanjaro airport). Precision Air had other plans and canceled our early morning flight to JRO so we were in Nairobi most of Sunday and arrived to our lodge in Moshi, Tanzania around 8:30 pm on Sunday night. REI was GREAT. I was able to call our in-country advisor, John, and let him know we would arrive almost 12 hours later than originally planned, and he was patiently waiting outside of JRO customs for us (bless him for that). Customs in JRO was so much quicker and quieter than customs in NBO (Nairobi) too. Customs and immigration lololol, those are stories for another day! We arrived at our simple but comfortable and nice lodge in Moshi, Tanzania, about a 90 minute drive from Kilimanjaro National Park as well as 90 minutes from its airport, but in opposite directions, they kind of make a triangle with Kilimanjaro itself at the tip of that triangle. I know that Karlie, Zoe and I were all very hungry and worried there would not be dinner still available for us, but there was! And we were greeted with hot towels and fresh orange juice by the staff of the wonderful Kaliwa Lodge. After putting our stuff in our rooms, getting instructions on what the night and next day would be like from the lodge manager, Prince, and meeting the one other person in our group who was already there (Greg) we ate dinner. He had arrived before all of us and then the rest of the group (Jody, John, Mark, and Lisa) arrived later than us! After dinner we all just wanted to crash, because we knew we had long days ahead of us over the next week and that we’d be woken up somewhat early for breakfast, orientation with the REI guides, a tour of the coffee farm, and a hike through the Chaga village by one of the Chaga tribesmen himself, named Thaddeus. We also knew we needed to sleep because of jet lag. The next morning, the three of us woke up early to see as much of the sunrise that we could. We knew the mountain itself was visible from the lodge grounds but we were unprepared for the view we actually woke up to, because it was spectacular even with the morning mountain haze. Z and K enjoying the sunrise and mountain views. The eight of us had a nice breakfast together, made introductions and got to know one another, and realized we were a great group. We really could not have asked for a better group of like-minded, adventurous, curious, thoughtful, and caring people to spend eight long days of hiking and all meals and lots of free time with. After breakfast, we met with our REI guides and they told us what the climb was going to be like, what each day would entail, processes, etc. They then checked all of our gear and clothing to make sure we had proper boots, enough socks, warm clothing, proper rain gear, etc. I am so glad that the three of us took the gear list seriously because we did use every item and every layer (more on that when I write about summit day). If we had not been properly outfitted, they told us they’d take us to a shop in Moshi on the way to the national park the next day to purchase whatever we were missing. Luckily, our group was prepared. Coffee plant and berries in the wild. Thaddeus standing next to the machine that separates the beans from the shells and explaining how it works. Coffee beans drying in the sun. After the coffee tour, we were back at the Kaliwa Lodge for lunch, a short break to organize ourselves for an afternoon hike, and to start organizing to leave early the next day, and then we set off with Thaddeus again toward the forest for an acclimation hike (of sorts) to a waterfall. We had a nice, hilly hike, spent some time in the cold water, climbed on rocks and trees for photos, and then walked back through the Chaga tribe’s village instead of the way we came because we wanted to see the village where Thaddeus lived. We arrived back a little after sunset to dress a bit warmer for dinner on the porch of the dining room lodge house. Every meal at Kaliwa was in the communal dining room, which was small, but every meal there was so delicious, slow, and peaceful. We had some really delicious food at the lodge and on hike itself! I don’t want to get ahead of myself but the kitchen staff on the mountain were/are magicians. The end of our hike and the source of some fun rest time and climbing time. Karlie posing and Mark tying his shoes. 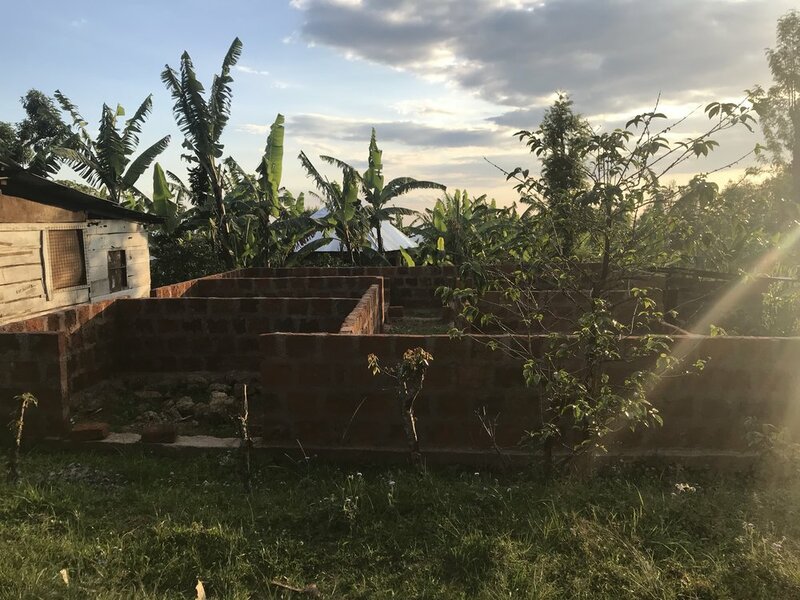 A new house being built in the Chaga village. The main road through the Chaga village. Pretty sunset through the trees on the walk back from Chaga to Kaliwa. And I’m sorry this is so long! The first day was full and kind of restful in comparison to the days that followed. We all had this nervous energy about what the actual hike would bring and I think we were excited and ready to get going to Kilimanjaro National Park the next day. Wednesday’s post will include all of the hiking, thoughts, and reflections of the first day from the Kili park gates up until our two days at Horombo Huts (approx. 14,000’ AMSL). Then I’ll cover SUMMIT DAY on its on the following Monday. Apr 10 Mt. Kilimanjaro, Marangu route: From the park entry gates to the Kibo huts.